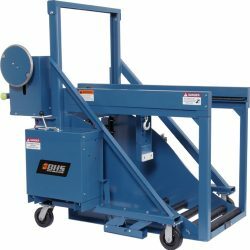 This combination manual extraction and powered lift Battery Transfer Carriage features a hand wheel for extractor arm operation. Raising and lowering is accomplished with a center-mounted hydraulic cylinder controlled by a manual control valve with overload relief for additional safety. Power is supplied by a 12-volt dc hydraulic power unit. Lift range is from 5.5 inches to 21.5 inches (140 millimeters to 546 millimeters). Download the product PDF above for full specifications.